This light is amazing it looks so elegant in my newly remodeled kitchen... highly recommend It even came with lightbulbs, it just arrived today I’ll attach a pic over the next couple of days. Love it ! 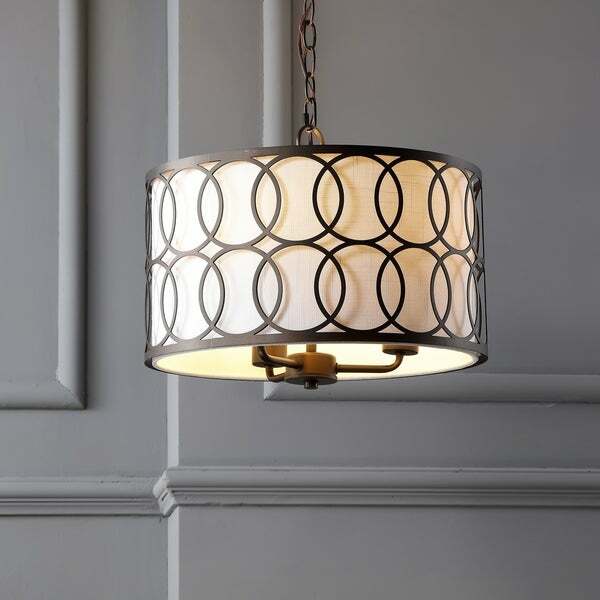 A double layer of open circle fretwork in a oil rubbed bronze metal accents the perimeter of the white linen shade on this stylish transitional pendant. Its length can be adjusted from a minimum drop of 16" to a maximum drop of 88" making it a great solution for high or low ceilings. With a 3-light capacity and an open base for easy bulb changes and maximum light, this hardworking fixture would be a great addition to any style of home. Dimensions 16.0 In. X 16.0 In. X 88.0 In.